Edmonton, AB, August 21, 2013 – Reservations are now being accepted for the DoubleTree by Hilton West Edmonton, a 238-room hotel scheduled to open in early 2014. Owned and managed by SilverBirch Hotels & Resorts, the hotel will be the first DoubleTree by Hilton in Edmonton and features designs that are inspired by the city of Edmonton and Alberta. Pre-opening special rates are available for groups of 10 or more starting at $149* per night plus applicable taxes and fees. DoubleTree by Hilton West Edmonton, formerly the Mayfield Inn & Theatre, is conveniently located on 109th Avenue NW near Edmonton’s most famous attraction, The West Edmonton Mall, and is minutes from the city’s downtown business district. Within the hotel guests will find the brand new SilverBirch Conference Centre® equipped with innovative conferencing technology and meeting amenities. The fully renovated hotel boasts warm and modern public area renovations, beginning with a dramatic new lobby and personalized check-in counters, along with the signature DoubleTree by Hilton warm chocolate chip cookie welcome. In addition, it features a destination oriented lobby lounge and bar to host a variety of social styles, welcoming guests for quiet coffees or spirited cocktails, all set in a business friendly atmosphere. 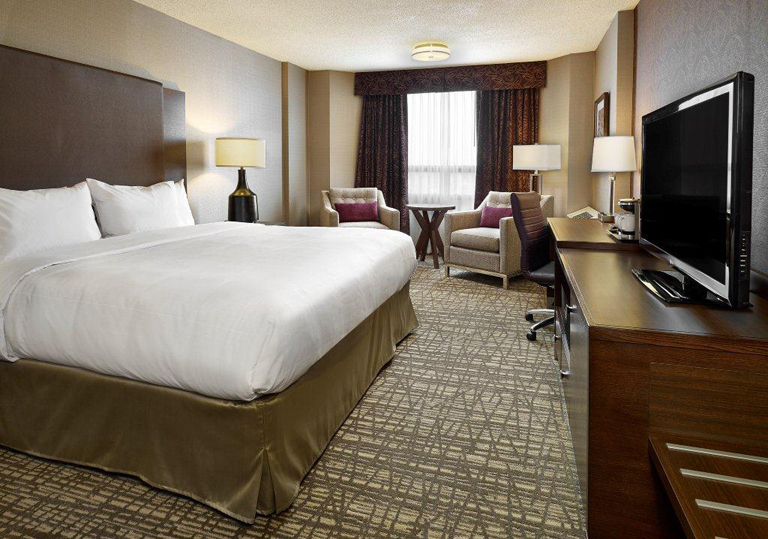 DoubleTree by Hilton West Edmonton offers warm and inviting guestrooms with newly appointed showers and fixtures, and upgraded suites that provide separate and enclosed bedrooms and living rooms, and large 3-4 piece bathrooms. DoubleTree by Hilton West Edmonton offers additional amenities, including a swimming pool, fitness room, Stages Kitchen & Bar® restaurant and more. Hospitality suites offer guests fully renovated luxurious finishes in conjunction with a flexible living space that is easily adapted for wedding preparation or meeting room functions. A self-service bar area provides additional opportunities for expanded use. For inquiries about the DoubleTree by Hilton West Edmonton’s special pre-opening group rate, please contact their sales team at 780-930-4000 or by email at yegnm_ds@hilton.com. Please note the special group rate is starting from and based on availability. Offer valid for first 90 days of operation. arrival and continues with the award-winning Hilton HHonors guest loyalty program, an array of fine services and amenities and our longstanding CARE Culture tradition that empowers more than 65,000 team members to provide the special comforts and acts of kindness that make the traveler feel human again.